Ford has become the latest US car maker to unveil a test vehicle that runs on green alternative fuels. It has launched the Edge - a hybrid car capable of running on a combination of compressed hydrogen and a battery pack that plugs in to an electric socket. However, major technical hurdles need to be cleared before such a car could be sold, Ford said. It comes as President George W Bush was set to ask Americans to cut petrol consumption by up to 20% by 2017. The target was due to be set out in his State of Union address. The President was expected to say he envisaged the target being reached mainly by a sharp escalation in the amount of ethanol and other alternative fuels being produced. Unveiling the new model at the Washington Motor Show, Ford said that the fuel cell in the vehicle cost millions of dollars to build. "Commercialisation... remains a tantalising but distant goal," said the company's vice president of environmental and safety engineering, Sue Cischke. 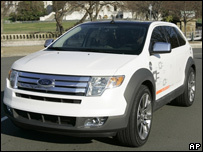 The hydrogen fuel cell could be replaced with an efficient petrol or diesel engine, Ford said. Analysts say that the car makers are pushing to develop environmentally friendly cars because they fear that their links with gas-guzzling vehicles is not helping their image. At the Detroit Motor Show earlier this month, General Motors launched its Chevrolet Volt concept car - the first mass market prototype designed to operate purely using an electric motor. The vehicle will be powered by new-style lithium batteries which will plug into your garage electricity socket. It could also feature a range of supplementary power sources including hydrogen fuel cells and an ethanol-based petrol engine. But last week, GM chairman Rick Wagoner warned that without support to develop alternative energy, the US "runs the risk of reverting back to our traditional energy policy". Consumer demand may also have waned, analysts said, as petrol prices have come down to around $2 a gallon - from close to $3 in mid 2006. Meanwhile, the European Union has delayed proposals to reduce carbon dioxide emissions from cars. European Commission President Jose Manuel Barroso is backing the proposal to force car makers to cut emission levels. However a spokesman said Mr Barroso felt "that more time was needed". The EU proposals were part of a package of measures which also covered fuel quality standards and competitiveness in the EU auto industry. It is thought the cost of "gas-guzzling" cars would soar under the plans. Some of the UK's best-known car makers could be hardest-hit. Currently the EU has a voluntary agreement with motor manufacturers - but they have infuriated the commission by missing their target by almost 50%.